How it feels to sole climb the “Via attraverso il pesce”. Each person has a dream. 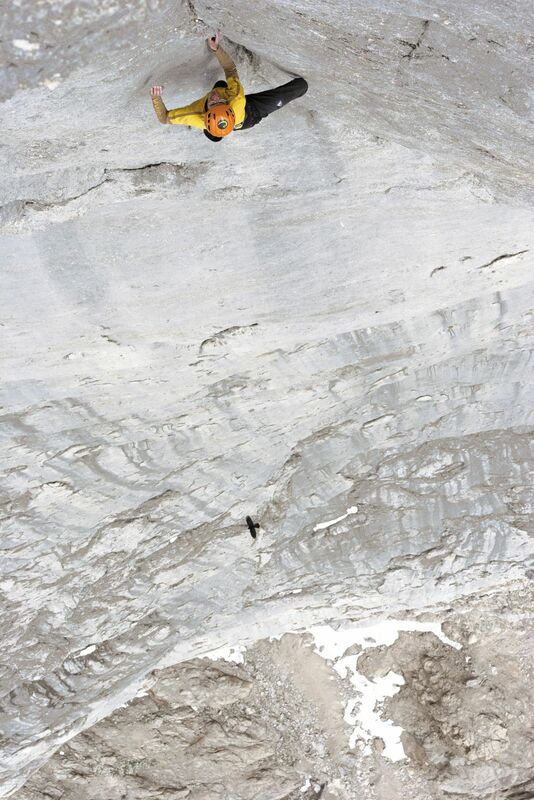 My dream was to free solo the ‘Via attraverso il Pesce’ on the Marmolada South Wall. I first started to secretly think about the project during Christmas of 2006. I didn’t intend to set a milestone in the history of climbing in the Dolomites, I was simply fulfilling a dream. I had already free soloed ‘Tempi Moderni’ on the same wall. That was the first step, but La ‘Via attraverso il Pesce’ was quite another story, because it is almost two grades harder, and it’s more committing and more exposed. It was not the matter of being the first or of setting a record. The point at issue was always the same: to fulfill my dream. The Route - Pure joy. To put emotions and feelings into words is a difficult task. Such sensations are very subjective and difficult to understand or to share with other people. This is particularly amplified when the risk of death is involved. There’s really no need for me to beat around the bush: the risk and the exposure of the solo I planned would be absolute. Yet the inner sensations created by climbing alone and unaided for hundreds of meters on a difficult wall would present an experience without equal. There is nothing more intense than the total commitment required to climb ropeless at the edge of your personal limits. You are completely centered on yourself. It is a dangerous and addictive game and, like a drug addiction, at a certain point you want it continuously because you cannot live without it. But such desires cannot be fed forever, and the game of soloing cannot be allowed to become routine. The lightness in your moves, the detachment, the feelings of your body being completely synchronized with the wall, and of your mind being focused on one affair only - can occur only a few times in a lifetime. Now that I am writing about it, thinking about it again, my hands are sweating. The more time that passes since that day of my extraordinary journey up that wall, the more the experience becomes unthinkable. When I recall the twenty minute approach hike I made on that April morning from the Falier Refuge to the start of the route I remember a very detached, yet focused, Hansjörg. The climb had already begun in my mind, even though I was walking alone on a trail. Yet even then there was no possibility to turn back. I began climbing at nine in the morning on April 29, 2007. I was there and the ‘Via attraverso il Pesce’ was there - and nothing else. I climbed the opening moves feeling a bit shaky. My movements were far from fluid. At the first belay, I rested for a bit. I closed my eyes and concentrated on my breath, inhaling and exhaling deeply for several minutes. When I started climbing again the trance became intense, my concentration incredibly clear. I have always been high-strung by nature, yet I felt no fear. Instead, I felt joy, and peace of mind. I was delighted at the thought of what was about to take place. I was there, and this moment had been waiting for me for months, or maybe for my whole life. Halfway up the wall, I began to feel the magical thrill of speeding upwards, over the rock. From that point on, everything happened as if it were a film in which I was author, screenwriter, actor and audience. The picture was crystal clear. I saw myself from the outside and I saw myself from the inside. It was incredible. My senses were stretched implausibly thin. I was joy. Pure joy. I was finally living my dream. Perhaps, saying this today, it sounds selfish and exaggerated, even excessive. But on that day, that’s exactly how it went.